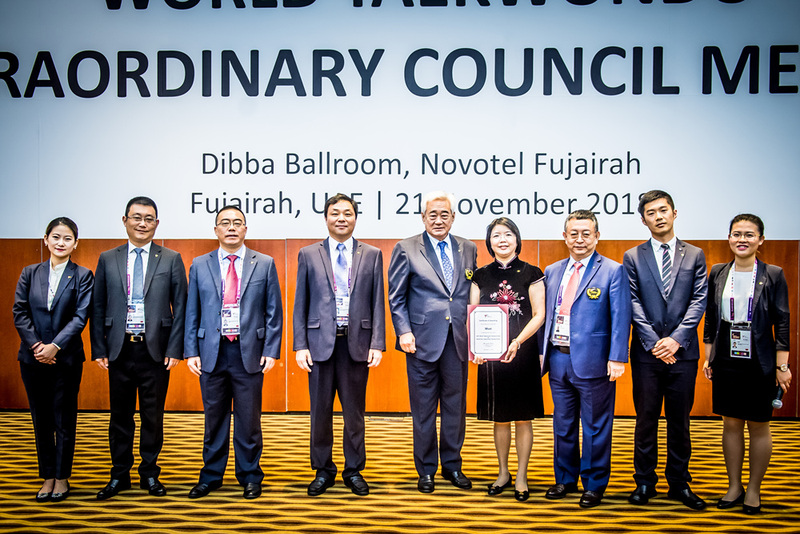 FUJAIRAH, UAE (Nov. 21, 2018) – Wuxi, China, was chosen as the host of 2021 World Taekwondo Championships and the World Para Taekwondo Championships at World Taekwondo Extraordinary Council Meeting, held at the Novotel Fujairah. The meeting started with a moment of silence for late WT Vice President and IOC Member Dr. Nat Indrapana, who passed away this year. WT President Chungwon Choue then thanked the host city, Fujairah, for its support, and mentioned that 2018 is the 45th anniversary of WT. A short video of the last 45 years was then shown. 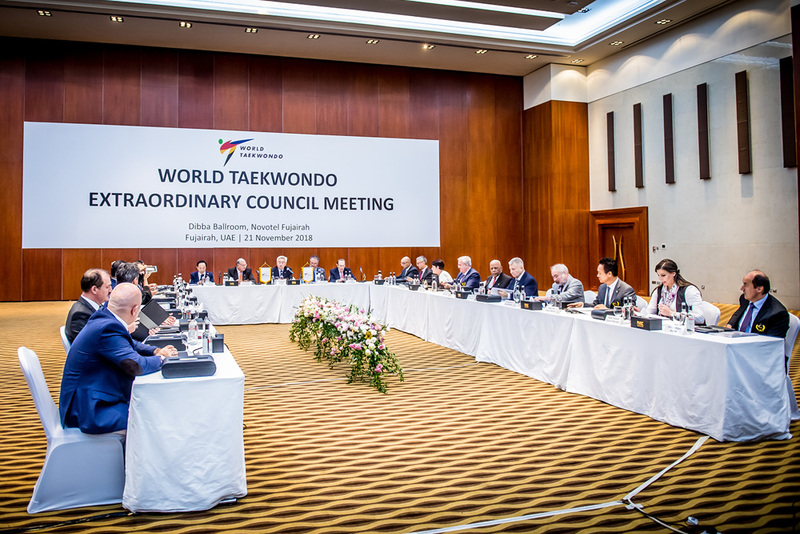 WT officials and the WT Demonstration Team were invited to Pyongyang, North Korea, in Oct-Nov this year and discussions took place at the time on future WT- International Taekwondo Federation integration. 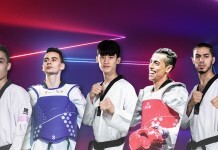 Next year – the 25th anniversary of taekwondo becoming an official Olympic sport – there are plans for WT and the ITF to carry out joint demonstrations in Europe, Choue said. President Choue declared that in light of certain incidents around the world, and in line with recent IOC communications to all IFs, WT will henceforth tolerate no discrimination against any MNA by another MNA or host country that impacts athlete participation on the basis of politics, religion or other reasons. “I urge the Council to collectively take the strongest stance against these unfortunate incidents and not award a sport event to a country that does not permit any athletes to enter the country due to political reasons,” he said. A motion was passed by the Council to this effect. Giovanni di Cola, head of the WT Sustainability Committee, noted how frameworks have been adopted, aligned with IOC goals, and that WT’s peace work, social integration, and gender practices are excellent benchmarks. There was also a briefing on WT strategic objectives. These include raising brand value and visibility, extending outreach via e-sports and upgrading sport presentation. On WT’s Safe Sport initiative, Athletes Committees Chair Nadine Dawani, briefed on how IOC toolkits to safeguard athletes can be accessed. THF Executive Director Roger Piarulli reported that an MOU has been signed with United World Wrestling, and talks are ongoing with the IFs of badminton, table tennis and handball, to include those sports at the THF facility in the Azraq Refugee Camp in Jordan. This will mean the facility will become a taekwondo-led multi-sports facility. And a new THF project has also been launched in Niger, with the Niger NOC, for six months. Piarulli also urged taekwondo groups globally to carry out fund-raising initiatives for the THF, and gave recent examples from Malaysia and Korea. The meeting’s biggest announcement was the awarding of the 2021 World Taekwondo Championships and 2021 World Para Taekwondo Championships to Wuxi in China. Wuxi was represented at the meeting by Vice Mayor Liu Xia who said, “I am happy and excited. We will do our best for preparing those big events.” Wuxi is investing heavily in the sport: It is the host and sponsor of the World Taekwondo Grand Slam inaugurated in 2017. The next Council meeting will take place in May, 2019, in Manchester, Great Britain.